Palestinian Football Association Jibril Rajoub has been suspended for a year from soccer matches on Friday, and fined 20,000 Swiss francs ($20,300) by the FIFA disciplinary board. 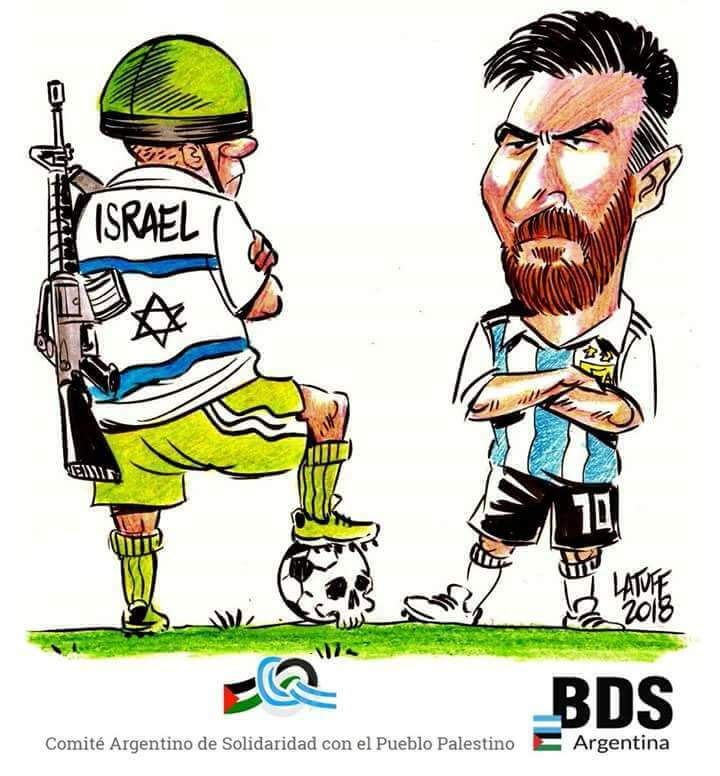 The suspension came is in light of calls by Rajoub to burn the jerseys of Argentine soccer player Lionel Messi ahead of his national team’s expected match against Israel on June 9, which was eventually cancelled. FIFA’s hypocrisy is boundless. On September 24 FIFA honoured Luka Modrić of Croatia, as World Player of the Year. His pro-fascist behaviour at the state welcome for the national team on July 15 following the 2018 World Cup in Zagreb shocked the Balkans. As the team bus made its way through a rally of some 500,000 people in the capital, Mr Modrić, the national team captain who won FIFA’s Golden Ball as the best player of the tournament, invited fascist singer-songwriter Marko Perkovic aka “Thompson” (pictured) to join the squad to the open-top bus. “Thompson” is known for his glorification of the German Nazi- and Vatican-created and racially pure puppet state of the Ustaša during World War II. The cancellation was a huge blow to Israel. It came after an intense global campaign that kicked off in Argentina and continued in Latin America and Catalonia in Spain, where the national team was practising for the 2018 World Cup in Barcelona, home to Mr Messi’s club side Barcelona, wrote Ali Abunimah at the time. It urged Argentina not to help Israel whitewash its most recent massacres of unarmed civilians in Gaza. It would have been the last match before the team’s official participation in the World Cup. The grassroots campaign included a direct appeal to Lionel Messi and his teammates from Palestinian footballer Muhammad Khalil Obeid. Israeli snipers shot Mr Obeid in both of his knees, ending a promising football career, during the first Great March of Return rallies near the Gaza-Israel boundary on March 30. “The original field of the match was Haifa. However and after political pressure took place from the Israeli government, as it was openly said by Israel’s Minister of Culture and Sports Miri Regev, the match was moved to Jerusalem. This is a decision that, given the current context, the Palestine Football Association utterly rejects and condemns. “The match itself is to take place in a stadium built on one of the at least 418 Palestinian villages destroyed by Israel 70 years ago, Al Malha,” said the letter. Israel openly uses sports – like the Giro d’Italia cycle race – for its political propaganda, while on the other hand it accuses athletes who refuse to be used in that manner of being the ones to play politics. The ban of Mr Rajoub will apply for the 2019 Asian Cup in United Arab Emirates, which kicks off in January, and likely include the start of the 2022 World Cup qualifying program. Mr Rajoub is able to continue his day-to-day work running the federation and attend FIFA meetings. He has been a constant thorn in the side of soccer’s governing body as he tries to get sanctions imposed on Israel. At the annual FIFA Congress, Mr Rajoub regularly addresses soccer nations to demand Israel be punished for restricting movement of Palestinian players, and for forming teams in West Bank settlements. “Israel has rejected the Palestinian campaign as an attempt to politicize sports and has cited security concerns as the reason behind the occasional restrictions placed on Palestinian players, particularly in the Hamas-ruled Gaza Strip,” according to Haaretez.